The Enfield Autocar Co. grew out of the Enfield Cycle Co. which had made bicycles, motor tricycles, quadricycles and from 1903, light cars under the name Royal Enfield. The cycle company continued, but more substantial cars were made by the new company. The directors were Albert Eadie who had been involved with Enfield bicycle manufacture since the 1890s, and E.H. Lancaster a leading figure in the promotion of the Clement car in England. 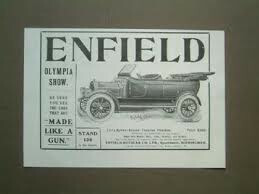 The joint skills of these men were not enough to save Enfield from the problems of the motor industry slump of 1907-08 and they were forced to hand over to a new board of directors who put Enfield Autocar up for auction. It was bought by Alldays & Onions. Alldays continued the Enfield designs for a year or two, but gradually the Enfield name was used for the more upmarket versions of Alldays designs.